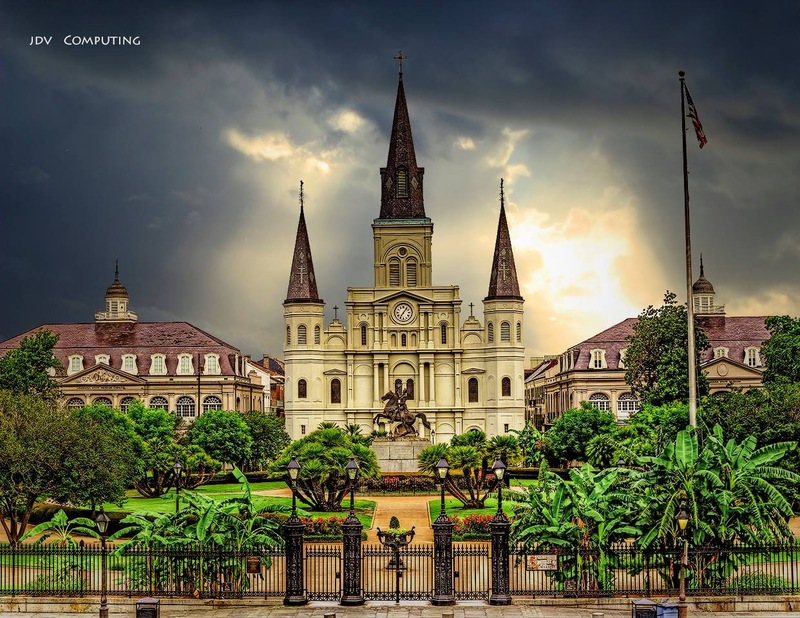 This is a photograph of St. Louis Cathedral in New Orleans taken and enhanced by our friend John Vlosich. I think it is just amazingly beautiful. The 29th and 30th of June are the dates the Lady Slipper Festival is held here in Kabetogama, Minnesota. Since we work from sun up to sun down on Saturdays we planned to enjoy the festival on Sunday. We went to church first at 9 where we were blessed to hear the family I talked about in my last posting sing Amazing Grace and heard a meaningful sermon. Marnie, Pastor Roger’s wife, gave me the information I’ll need to do the crafts for VBS. One thing that was really wonderful was this. A photographer named Tom and his friend Russ were at the resort the last few days doing 360 degree photographs of each of the cabins and the resort. I don’t think we got in any of the pictures but anyway, last night Tom the resort’s owner learned that Russ had been Pastor Roger’s best man at his wedding decades ago. 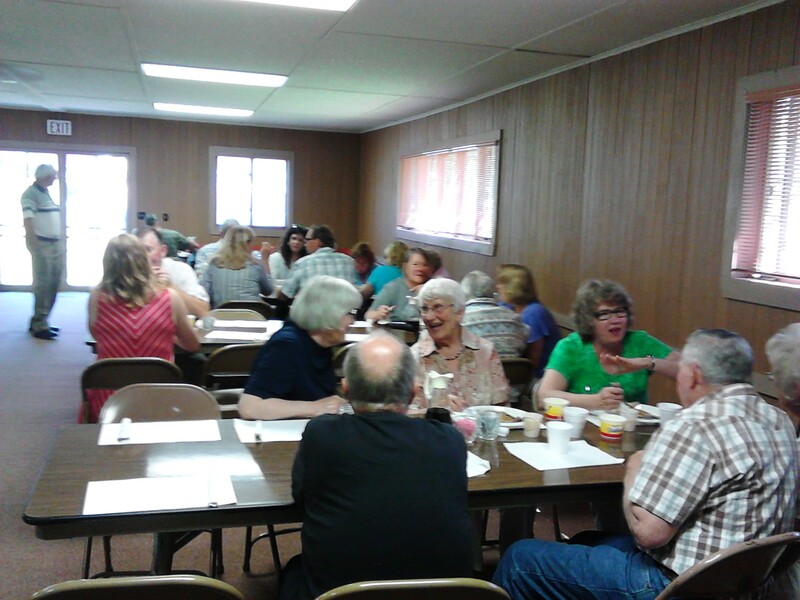 Tom immediately said “well you’re going to church with me in the morning!” Roger didn’t know Russ was up here and when he spied him in the congregation today his eyes opened wide and out he spurted Russ’s name. Roger’s wife Marnie was so surprised also and told everyone that Russ was their best man. It was a really nice joyful reunion and I felt blessed to witness it! 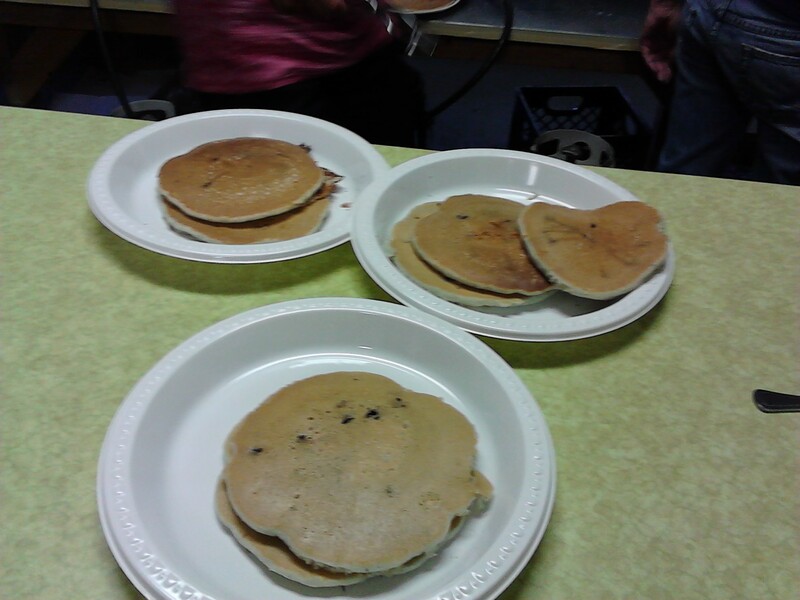 After church we hustled over to the Senior Citizens Center to check out the blueberry pancakes. They were made from wild blueberries that grow in this area and were flat out delicious! We got two or three pancakes and a couple of sausage links, coffee, orange juice or milk. It was sponsored by the church we go to and I learned they do this twice a year and we’ll be here in August when they do it again. 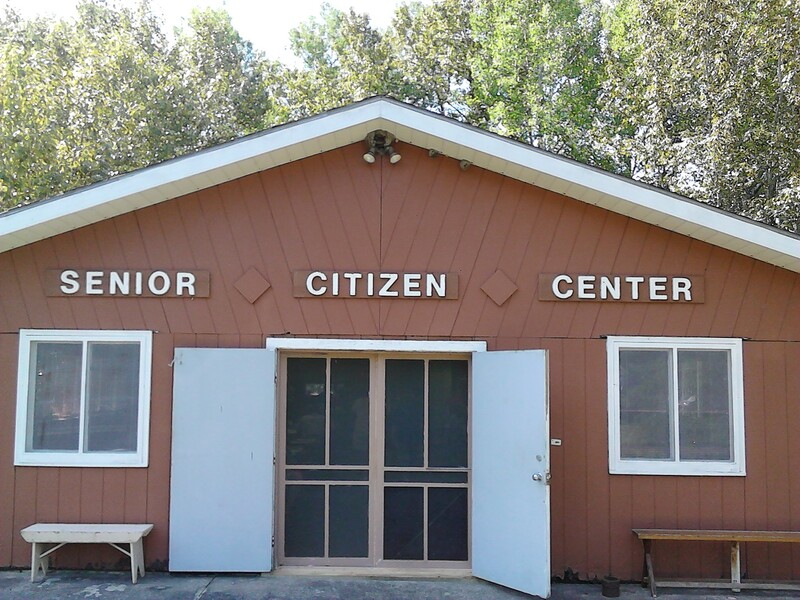 This seems to be all they use the Senior Citizens Center for, though I had visions in my mind of Roy and I joining other old folks quilting and chewing the fat! Oh well! 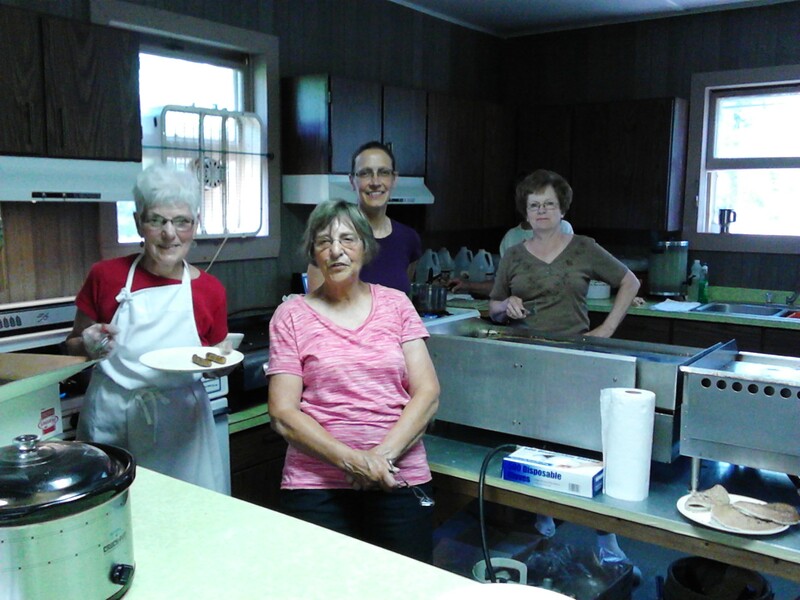 We did find out that at the Kabetogama Community Center on Tuesday and Thursday nights at 8 they have BINGO and we will definitely be checking that out on Thursday nights since we are off work that day. The festival consisted of maybe a dozen tents with arts and crafts vendors and a few old antique cars (not many). Guess the Strawberry Festival in Ponchatoula isn’t in any danger of being rivaled by the Lade Slipper Festival. I came home and took a rare nap for two hours and then set out for Woodenfrog State Park for a Blue Grass Concert. We rode around and around and around the park and found nothing that resembled a concert or even a group of people assembled who might at some point start singing! We headed back home and decided to stay in for the evening and rest. Our work week is Monday and Tuesday and we’ll be doing our scavenger hunt with the children Monday at 1 so we’re resting up for those two long days. 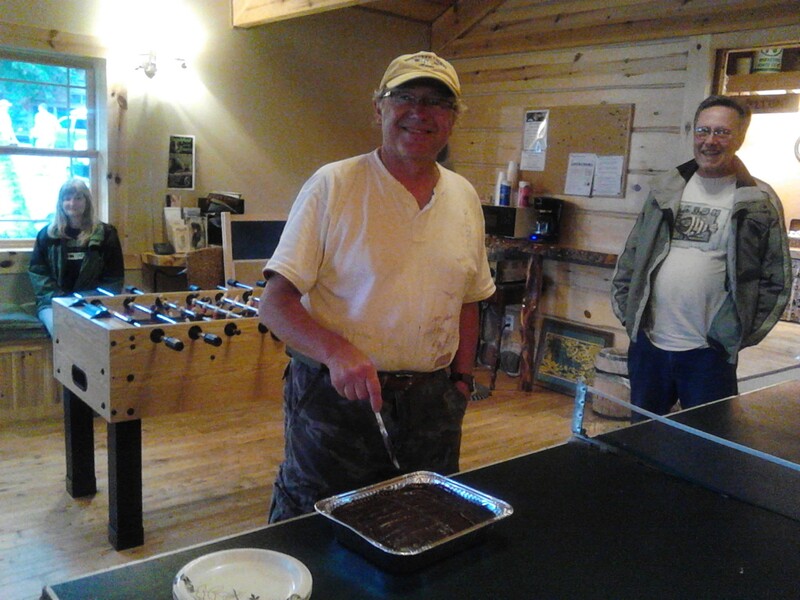 Friday night we celebrated Tom’s birthday with a chocolate cake baked by Debbie. We all gathered in the Lodge for this and really enjoyed the cake! Hope you have many more Happy Birthdays Tom! The man behind Tom is Russ, the man who was Pastor Roger’s best man. Just got off the phone with Madisyn (yes we are getting to talk to her better) and she was so cute. She got the latest package we sent her in which we included a bag of “Bear Poop”. We told her we were sending her some and when we called she was so excited about it because when she got it, it turned out to be chocolate and she said she had it all over her mouth! Love that little squirt! Found out I was wrong about how many more dreaded Saturdays we have left. We’re now at 8 and counting down! That was so nice of you to share JohnV’s art work. He just loves doing that stuff. He is also teaching me, although I have a long long way to slide. It is fun and something for us to do together. We are going to be going to Alaska this week. We will transfer planes in MN. on our way there. We think of you often and enjoy you blog, really!. 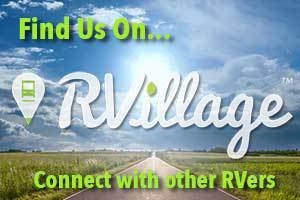 What city in Minnesota do you transfer planes? I’d love to go to Alaska sometime and we plan to, just don’t know when. I’m amazed at John’s abilities with art and just loved the St. Louis cathedral one so much I wanted to show him off!